Many people believe that electronic data storage has eliminate the need for advanced office storage and filing devices. This is a limited perspective for two reasons. First and foremost, hardcopies of data prevent permanent data loss that can result from faulty backups and computer hard drive failures. Secondly, vertical file cabinets are often more expensive than many of the high density filing systems sold by Cubiture. High density filing systems feature a number of basic designs that combine ease of access with space consolidation. 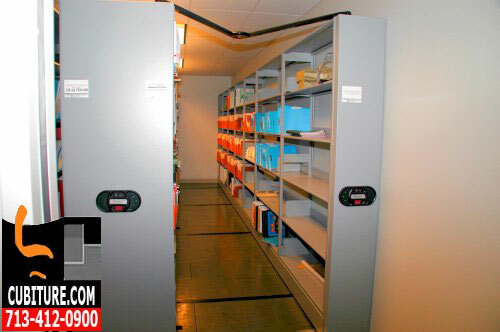 Lateral File Storage Lateral filing systems can reduce storage space by up to 200%. Easily able to hold twice as much as standard file cabinets, they are an ideal solution for a small company that has outgrow its file cabinets and is facing office storage space challenges. Many freestanding units feature anti-tip safety mechanisms for added stability. Rotary Files Another popular filing system features a rotary mechanism that doubles storage space. By utilizing both sides of the units, you can double the capacity of lateral or vertical systems. 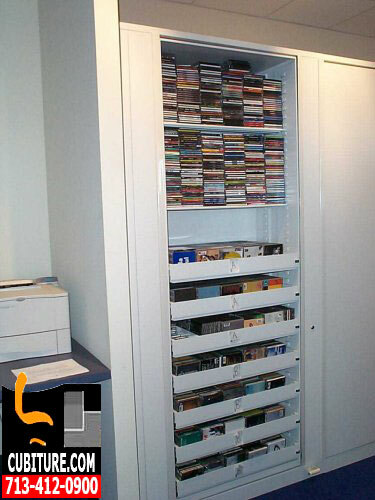 This is a favorite office storage solution for companies who need to organize a variety of media. Tapes, notebooks, and cds can all be organized within these units. 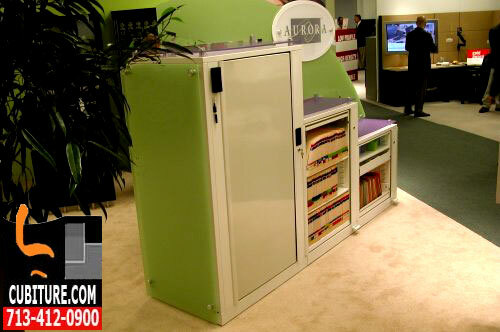 Cubiture also has compact units that will allow you to store coats, purses, office supplies, and personal cell phones. 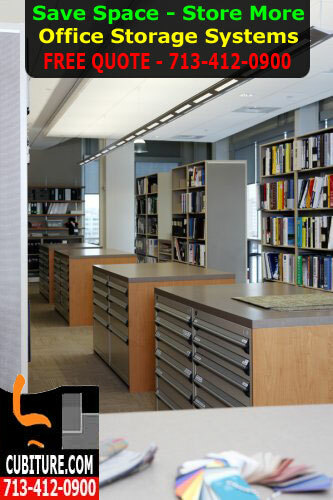 Shelving Systems and Compact Units File cabinets are not the only mechanism for storing documents and other materials. Various types of shelving are used by a wide range of industries, including medicine and education. Media storage, laboratory supplies, industrial products, office supplies, and special gear can all be stored on various types of shelves. Wire Shelving The most basic shelving solution for office storage needs is the wire shelf. Food service companies in particular appreciate the accessibility that a shelving unit adds to stock picking and inventory control. Educational facilities also find wire shelves very useful for storing textbooks. Hospitals use them to store medical equipment and surgical tools, and restaurant kitchens use them to store supplies and utensils. In the office world, shelving systems often take on the physical appearance of filing systems in order to blend with their environment. The most popular type of shelving solution in offices is the mobile shelving unit. Mobile Storage Also known as compact shelving systems, mobile storage units rank among the more popular types of high density office filing systems. They derive their name form a set of tracks that allow the files to roll along carriages. This eliminates the need for separate aisles between units because you can simply roll the units along the track to access a particular section. Mobile systems are typically highly decorative as well, so you can integrate them into your surrounding office furniture without necessarily having to place them in a separate room. 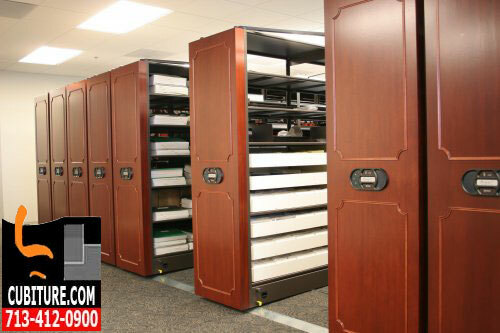 Mobile office storage systems offer the maximum possible records you can store per square foot. Some can reduce storage space requirements by as much as 300%! Mobile units can be electronically or manually controlled, depending on the model. In addition to potentially lower costs, high density filing and office storage shelving systems give you the added value of conserving precious floor space. Many organizations who have purchased high density filing systems or shelving units from us have found that they can save trim costs on their next office lease because they require less square footage for document storage. Additional savings sometimes result from leasing smaller spaces because the cost of utilities in smaller offices tends to be lower. Simplifying and consolidating storage efficiency results in an increase in overall productivity. This is particularly true for the legal, financial services, medical, and educational industries, but it also holds true for industrial and service-based companies who rely upon accurate documentation to track orders, service calls, and vendor transactions. With over 25 years of experience in designing high density filing systems and office storage solutions, our space planning team can show you how to maximize both your workspace and your storage space with a free office design layout drawing. This layout drawing will show what types of storage systems will work best with your particular choice of cubicles, office furniture, seating, and millwork. Don’t put up with shrinking office storage space any longer. Call 713-412-0900 to get more from existing space at far less the cost of remodeling or office relocation.